Convergence scares me. I don't need all my devices to do everything—I'm bothered enough by the fact that my kitchen contains like six clocks. It's hard enough keeping them all on the same time. So a coffee-maker that also displays the weather forecast seems a little wacky. I mean, I realize that many people are bleary before they've had their morning wake-up juice, but is that really the best place for weather info? What about, oh, the Internet or the local news? Okay, you got me. I don't even drink coffee. There, I said it. Black tea is my poision of choice, and if you think it can't pick you up as much as coffee can, well, you haven't had the right stuff. Back to the coffee-maker. 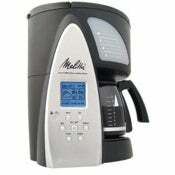 The Melitta Smart Mill & Brew displays weather info based on Microsoft's MSN Direct (aka SPOT) tech, which gets info over FM radio signals. The coffee-maker runs about $200, and will even grind your beans for you. No weather info necessary. Slick.